Unichip North America (UNA) is the US division of an international organization of car enthusiasts dedicated to making engine power… the most power available from any given combination of parts. Over 15 years ago, when engine control began transitioning from re-jetting your carburetor and chalking your crank pulley so you could see it with a timing light, our tuners wanted to continue performance tuning… and realized the best way to do so was to create a programmable computer to control the OEM computer. Because the computer they created was a universal device that could manipulate any type of engine… they called it the Unichip. A decade an a half later, through continuous improvements and updates, Unichips remain the most capable engine control computers available. UNA is at its core an engineering firm staffed by car guys. Electrical engineers and automotive engineers combine their talents to solve real world tuning challenges. For do-it-yourself enthusiasts who want to install parts on their vehicles at home, UNA creates Plug-n-Play kits that allow them to install a Unichip programmed with calibrations optimized for the most popular bolt-on accessories simply and quickly. 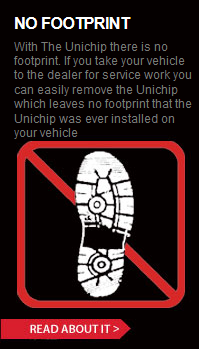 For enthusiasts looking to go to the next level, all Unichip products are real time custom tunable on either the street or on the dyno by qualified tuning shops. Finally, for aftermarket manufacturers… from turbo charger kits to cold air intakes…the Unichip can be calibrated to optimize any set of compatible components. All with a single computer and one set of software. To round things off, our Flux2 In Car Display connects to any Unichip & instantly adds a professional user friendly interface. In conjunction with our overseas affiliates, performance Unichips are used in 47 countries around the world as the preferred tuning solution… where ever you find car guys looking to make more power, you’ll find the Unichip. We supply OE companies like Mitsubishi and Isuzu who sell Unichip packages right off of the showroom floor as well as aftermarket manufacturers like APS, Turbonetics, Vortech, Procharger, and Turbo Center among others have selected Unichip as their engine control solution. Our employees are where you are… on the street, on the track, in the mud, or climbing rocks, performance and power courses through our veins just like it does through yours!